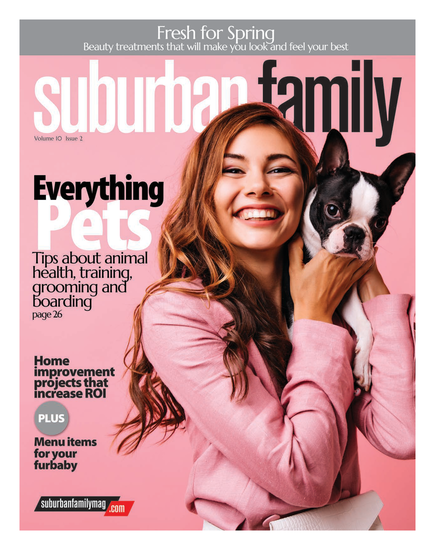 We’ve introduced the readers of Suburban Family to a number of outstanding citizens over the last year. From students who raised money to drill a freshwater drinking well in Nepal to a World War II veteran who has volunteered more than 7,500 hours at a local hospital, there are some very special people doing some great things in South Jersey. While all of the Star Citizens we’ve shared on these pages have done admirable things, here we present 19–plus 5 new ones who recently caught our eye—who really stood out to us, citizens who went above and beyond to make their communities a little better and their lives a little richer. Giannotti, a Haddonfield artist, has had his work displayed in locations around the world. While he is known internationally, his work has also made an impression in several South Jersey towns, including Camden, Haddonfield (where he created the Hadrosaurus sculpture) and Pennsauken. Though Giannotti does profit from his pieces, he also donates just as much of his time and work, as evidenced by “The Little Artist” statue he donated to his hometown in 2013. After Haddonfield art teacher Hillary Johnston lost her life to cancer in 2011, dozens of students and community members felt her absence. Giannotti created the statue in her honor, forgoing the commission that would normally cost $25,000. Furfari, of Marlton, and Danze, of West Deptford, initially joined forces when Furfari asked Danze to be her coach in the 2013 United States Pageant System’s Miss Teen New Jersey competition. After being crowned Miss Teen New Jersey, Furfari, 17, and Danze, 27, a former Miss New Jersey of the United States Pageant System herself, decided to further their successful partnership by forming the nonprofit organization Tiaras Loving Children (TLC). Through the organization, Furfari and and Danze hold fundraising events throughout the year for several groups and causes. They also hold the Miss Belle of the Ball pageant for special needs children. It’s not unusual for an 11-year-old to have an affinity for riding his bicycle, but Humphreys doesn’t just ride for pleasure with his buddies. He rides for a cause, namely the American Cancer Society, after his grandfather, Bill Williams, lost his battle with lung cancer in 2012. For the past two years, Humphreys has ridden with Team Evesham, a local biking club, in the American Cancer Society Bike-a-thon to help raise money for cancer research. The annual event begins on the Ben Franklin Bridge and ends at the Buena Vista Camping Park in Atlantic County. In 2012, Humphreys rode 21 miles of the course and raised $1,040. In 2013, he rode the entire 65 miles of the course, raising $2,700. University of Pennsylvania faculty member and Cherry Hill resident Duckworth was awarded a grant recently that will allow her to continue her study of the concepts of self-control and grit. The research psychologist received the grant from the John D. and Catherine T. MacArthur Foundation, a Chicago-based organization that “supports creative people and effective institutions committed to building a more just, verdant and peaceful world.” Duckworth, who holds degrees from Harvard and Oxford universities, as well as a Ph.D. in psychology from the University of Pennsylvania, was one of 23 scholars and artists who were honored for their creativity and direction with a grant. She will receive $625,000 over the next five years under the grant. While volunteering for Habitat for Humanity in Guatemala as a Fordham University junior, Armstead-Williams had a conversation with a team leader that would change her life forever. The leader, as it turns out, was a former Peace Corps volunteer, and their discussion influenced Armstead-Williams to join the Corps herself. Now stationed in Mozambique, Africa, where she’s finishing up two years of service, the 24-year-old Moorestown High School graduate is working as a secondary English volunteer for the locals, as well as contributing to community projects there. Working as a volunteer in a foreign country isn’t for everyone, but for Armstead-Williams, who is interested in helping those in need however she can, it seems to be a perfect fit. We all know distracted driving can lead to accidents, but no one knows better than Lesher, a Lenape High School senior, who herself was involved in a serious auto accident involving a distracted driver that left her in Cooper University Hospital’s intensive care unit for two weeks. Ironically, the accident occurred as Lesher, 17, was studying to receive her license and learning all about the dos and don’ts of the road, including driving distracted. In an effort to make sure others do not have to suffer through similar experiences, Lesher started a Just Drive campaign, through which she advocates safe driving and community awareness. She also raised $3,000 for The Cooper Foundation’s trauma center so that the center can continue to treat patients with the same attention and care that she received. After making a radical change in his life over the course of a year and losing 221 pounds on the reality show Extreme Weight Loss, Epstein (pictured with trainer Chris Powell, right) has been paying it forward. The Cherry Hill West graduate and Voorhees resident, on his Facebook page, Mike Epstein-Extreme Weight Loss, now posts pictures and words of encouragement for those struggling with weight problems just as he did. The former football player is also making speaking appearances, has appeared on local television programs, and is helping with open casting calls for Extreme Weight Loss, all in the hopes of encouraging others to make positive changes in their lives. Iannone, an eighth-grader at Chestnut Ridge Middle School, has been sharing her artistic abilities with South Jersey and the country. Last spring, she brought national attention to South Jersey after winning the annual “Doodle 4 Google” competition in the sixth- and seventh-grade category. The competition, which accepts submissions from all K-12 students in the U.S., features illustrations created by students to be used on the main page of the Google website. By winning her category, Iannone, whose illustration reflected her love of astronomy, received a $5,000 college scholarship, as well as a trip to New York City and a digital design tablet. More recently, Iannone helped illustrate the children’s book Just Us, which was written by Woodstown native Oscar Hernandez, and is available on the iPhone and iPad app Lil’ Readers, an app developed by Woodstown native Justin Furniss. Moorestown High School juniors Hyman and Troy are not only student-athletes, but they are also the founders of Breakfast Buddies, a program that provides nutritious before-school snacks for underprivileged students in the Moorestown school district. Breakfast Buddies is affiliated with MooreKids, a nonprofit organization connected with the Moorestown public schools that ensures the needs of underprivileged students are addressed. While Moorestown students may be offered free or reduced lunches, they are not offered anything for breakfast, which is where Breakfast Buddies comes in, offering nutritious options in the morning. Since its inception, Hyman and Troy have held food drives for the program and have worked to educate their community about the importance of a healthy start to the day. Davis, of Marlton, and Jeffreys, of Cherry Hill, were not content last summer to have mundane jobs to fill their days until their college courses started again. Davis, who studies at the Platt Institute in Brooklyn, and Jeffreys, who studies at Camden County College, wanted jobs that would allow them to share their knowledge with others, so the duo flew to Israel to serve Camp Kefiada through a program sponsored by the Jewish Federation’s Department of Education. At the camp, located in Arad, they taught elementary school students English, among other subjects. In addition, they worked to bridge the barriers that exist between Jews in the Delaware Valley region and Jews in the region surrounding Arad. When it came time to decide on their Girl Scout Silver Award Project, Samson and Adams decided to complete a project that would benefit a number of young, at-risk children. They developed “Project Read to Me,” a book drive to benefit BookMates, a South Jersey literacy program. The girls collected almost 1,100 books from friends, family and other members of their community through the drive. The books were donated to the Veteran’s Memorial Family School in Camden, and because Adams and Samson were able to collect so many books, students in kindergarten through second grade at the school received at least three books each to keep. The Mount Laurel residents were also able to donate a number of books to their local library. When Fiedler discovered a need in his community, rather than ignore it, he decided to do something about it. The Moorestown High School graduate, who discovered many South Jersey high schools do not have Gay-Straight Alliance (GSA) clubs, helped initiate Kaleidoscope, judgment-free hangout sessions for lesbian, gay, bisexual and transgender individuals between the ages of 13 and 18 in Burlington, Camden and Gloucester counties. The goal of the club is to allow teens to meet new friends and gather with old ones without being judged on sexual orientation. The youth-led group meets monthly at The Spot Teen Center in Voorhees and participated in the first ever GSA Forum held at Triton High School in November. Now a freshman at the University of Pennsylvania, where he serves on the board of Lambda Alliance, the main LGBTQ umbrella group that works with administration and student government to ensure LGBTQ-inclusive and sensitive policies, Fiedler’s main role is to coordinate outreach with admitted students to highlight the accepting community there. Treiman brought a new flair to the local 4-H Club when he started the Science Explorers, a robotics club for children between the ages of 10 and 14. The Cherry Hill resident says when he started the club his hope was to help children develop problem-solving skills as well as socialize, and the club has really taken off. He says the original group of five eighth-graders has grown to 16 kids and the plan this fall is to expand a new “Cloverbuds” group, which is a similar program for children in kindergarten through third grade. In its first year, Treiman says the club built and programmed robots, and is currently working with model rockets, space and astronomy. The club also held a robotics competition this past February and their robot was able to advance to a championship competition in Delaware. Inspired by the book Do Hard Things: A Teenage Rebellion Against Low Expectations, by Alex and Brett Harris, teenage friends Buchan, of Mount Laurel, Hunt, of Haddon Heights, Rayesky, of Medford, and Spuler, of Marlton, decided to take on a fundraising project that would raise money to drill a freshwater drinking well in Nepal. Over the course of several months, through their group, “Strength in Numbers,” the teens raised money for the nonprofit organization Charity Water, which helps to ensure citizens in third-world countries have clean drinking water. Successful in their venture to raise the required money to drill the well, Buchan, Hunt, Rayesky and Spuler’s rebellion against low expectations proved they are anything but ordinary teenagers. A common complaint these days is not having enough time in the day to complete everything on our to-do lists. As such, many of us aren’t able to contribute to our communities as much as we’d like, but that’s not the case for Massi. A career firefighter and EMT, she serves her community every day, but her commitments extend beyond the 9-5. An avid fund raiser, she has contributed to the Muscular Dystrophy Fill the Boot fundraiser and Relay for Life, and has also participated in the Marine Corps Marathon for the I.A.F.F. Charitable Fitness Team. Massi is also a member of the Athletic Trainers Society of NJ, the Mullica Hill Women’s Triathlon Club, the Cooper Hospital Critical Incident Response Team, the Burlington County Technical Rescue Team, and the Mercury Critical Incident Stress Management response team. In recognition of her contributions, the Burlington County Advisory Council on Women chose Massi as one of Burlington County’s Outstanding Women of the Year in 2013. In 2006, Fanous, a Marlton resident, founded the G.I. Go Fund, a nonprofit organization in Newark that helps military veterans get back on their feet after returning from war. Whether it’s assisting in the job hunt or the house hunt or the securing of educational and health benefits, the G.I. Go Fund does its best to ensure veterans regain their proper places in society. Since its inception, the fund has expanded to Washington, D.C., Baltimore and Philadelphia, and thousands of veterans have benefited from its programs. For his commitment to the fund, of which he is also executive director, Fanous was selected in 2013 as a recipient of a $25,000 Russ Berrie Award for Making a Difference. Established in 1997, the Russ Berrie Awards recognize the community service or acts of heroism performed by New Jersey residents. A self-described “doer,” Subber is a volunteer at Kennedy University Hospital in Washington Township. This isn’t a position he just recently decided to pick up, though. World War II veteran Subber began volunteering at Kennedy two weeks after he retired from the U.S. Postal Service in 1986. That was 27 years ago, and at 89, he is still volunteering at the hospital today. Helping to assist in the management of other volunteers at Kennedy’s Washington Township, Cherry Hill and Stratford campuses, Subber was recognized last April for surpassing 7,500 hours of service for the hospital system. Published (and copyrighted) in Suburban Family Magazine, Volume 5, Issue 2 (April, 2014).